In 1995, painter Hilda Goldblatt Gorenstein — whose nom d&apos;art was "Hilgos" — was placed in a Chicago-area nursing home because of steadily worsening dementia. Lawrence Lazarus, then a Chicago psychiatrist specializing in treating the elderly, remembers that she was withdrawn and sometimes agitated — so much so that Lazarus, a former president of the American Association for Geriatric Psychiatry, prescribed a mild tranquilizer. She had stopped painting several years earlier, as she entered the great isolation booth that is Alzheimer&apos;s.
But one day her daughter, Berna Huebner, asked her mother if she&apos;d like to paint again. Gorenstein responded in a surprising way. "I remember better when I paint," she said. Huebner quickly told Lazarus, who suggested that she contact the School of the Art Institute of Chicago (which Gorenstein had attended in the 1920s) to hire art students to work with the elderly artist. This was a somewhat unorthodox thought; although art therapists had for years worked with people with Alzheimer&apos;s, using artists without training in therapy, not to mention very young ones, was something else. The first student in the project was Jenny Sheppard, who worked for some weeks trying to lure Gorenstein back into painting. But the elderly woman stayed withdrawn and silent, and nursing-home officials, who were dubious about having art students working in the facility at all, were not encouraging. One told Sheppard: "You&apos;re wasting your time. The lights are either on or they are off, and with Hilda, they are definitely off." Yet, in time, Gorenstein did pick up a brush and complete her first painting in a decade — wavy, brightly colored lines and the intriguing words "The Hidden Hour." But then she stopped painting again. Sheppard persisted, but after several months, the young student was ready to give up. As Sheppard was leaving one day, Gorenstein, out of the blue, beckoned to her with her notably long fingers and said: "I&apos;ve never had something like this, you know, so let&apos;s just keep it this way." On Sheppard&apos;s next visit, Gorenstein resumed painting. And over the next three and a half years, Gorenstein would create hundreds of watercolors. Many had strong representational aspects, especially those with the nautical themes she had long specialized in. But others were deeply abstract and sometimes mysterious — lines and circles in bright colors. Sheppard was the first of several Art Institute students over those three and a half years to work with Gorenstein. Another, Jane Benson, now a sculptor in New York, told me that the artist became "transformed when she was painting" — although Benson said she couldn&apos;t know how much of this carried over when she left her brushes and went downstairs to her room. Would it have been better if the students had had art therapy training? Timothy Daly, another Art Institute student who worked with Gorenstein, told me, "If I had some training in art therapy, it would have given me more insight into what might be happening [neurologically] and how I could take this energy further. ... I felt like I was a family member who was interacting with his grandmother by means of painting together." In any case, Lazarus and all the students I spoke with said Gorenstein tended to be much calmer and more focused when working on her painting with the students. She would even interrupt long silences with banter and advice, such as, "The first thing you think of is the first thing you use." Sometimes the students would have to put a brush in her hand to get her going. At other times, once they had set up her paints and brushes, she would start by herself. The artist had a highly idiosyncratic way of putting ideas together, drawing on what she saw around her. Another Art Institute student who worked with Gorenstein, Robin Barcus Slonina, said the elderly artist named one of her vivid watercolors "Jewel Distilled" — after she saw a bottle of distilled water from the Jewel food store. Huebner was overjoyed to see her mother&apos;s improvement and began to educate herself about Alzheimer&apos;s and its treatment. The Art Institute, its art therapy department and the school&apos;s chancellor, Tony Jones, became her allies. In 1998, after some months of rapid decline, Hilda Goldblatt Gorenstein died at almost 94, ending her very-late-in-life artistic re-flowering. After her mother&apos;s death, Huebner created a nonprofit organization, the Hilgos Foundation (hilgos.org), to promote the arts among people with Alzheimer&apos;s. With quiet relentlessness, she signed up members of her international network of friends to help reach out to arts, medical, social service and other organizations. She has quite a network. A small, soft-spoken woman in her late 60s, Huebner has had a long public life that included stints as research director for former Vice President and New York Gov. Nelson Rockefeller and as the chairwoman of nonprofit organizations in various places, including Paris, where she and her husband have lived full- or part-time since 1979. The initial mission of the new Hilgos Foundation was to raise money to pay students from the Art Institute to work with Alzheimer&apos;s patients, but it has since come to encompass a public education role as the disease becomes an ever larger problem for a society with lengthening life spans. Students in the Hilgos project, in which four "Hilgos scholars" participate each academic year, have served more than 100 people with Alzheimer&apos;s.
Huebner has drawn on the growing recognition by neurologists and other experts that, as Dr. Robert Stern of the Boston University School of Medicine told me, "participating in art, including music, can stimulate emotions that engage parts of the brain that are less damaged in the earlier stages of the disease." A colleague of Stern&apos;s at Boston University, Dr. Robert Green, expanded on the notion: "It&apos;s fascinating to see how art can let you access the hidden talents of people with Alzheimer&apos;s disease. There&apos;s a lot more going on with these patients than you&apos;d expect. ... Art projects might stimulate people, help them experience the world more fully and give them pleasure." All the doctors I spoke with said that improved drugs to combat Alzheimer&apos;s might be some years away, but meanwhile, the arts, both participatory and more passive (such as visiting museums and listening to music), can play a role in maintaining a higher quality of life for patients. A number of experts referred to heightened "sense memory" or "body memory" when trying to describe what happens to some Alzheimer&apos;s patients when they work on art. So far, about 40 Hilgos scholarships have been awarded. 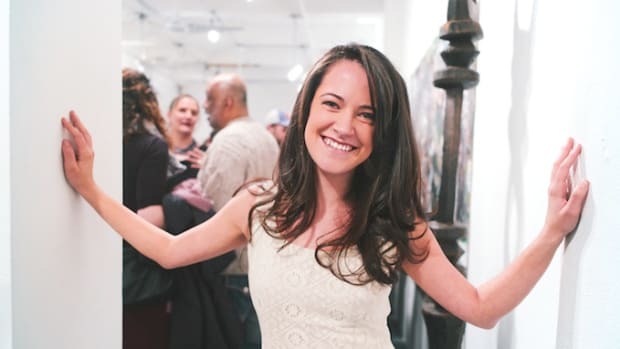 Huebner hopes to widen the project by getting other art schools and professional caregivers in the U.S. and Europe to set up cooperative programs similar to what she established in the Chicago area. While expanding her mission to include public education about Alzheimer&apos;s, Huebner got into the movie business. In 2002, she gave a talk on the Hilgos project in Paris, attracting the attention of a friend, Mary Louise Stott, a public relations executive who was also a friend of French film director Eric Ellena. Stott later introduced Huebner to Ellena, who had been looking for new documentary ideas. Thus was born I Remember Better When I Paint. The movie, made in 2008 and 2009, was co-directed by Ellena and Huebner. Using Gorenstein&apos;s story as the impetus, the film dramatizes the challenges presented by the Alzheimer&apos;s epidemic and medical, psychological, sociological and art-based approaches to dealing with it. It&apos;s a mix of personal stories and science, crisply narrated by then-93-year-old movie star Olivia de Havilland (of Gone with the Wind fame). The film includes an emotional interview with Yasmin Aga Khan, movie star Rita Hayworth&apos;s daughter; Hayworth developed early-onset Alzheimer&apos;s and also painted. Using scenes of Gorenstein and other elderly people creating or simply experiencing visual and musical art; interviews with neurologists and other health care professionals; and visits to senior centers, nursing homes and museums in the U.S. and France, the film is a quietly moving and sometimes drolly funny exploration not only of Alzheimer&apos;s treatment, but also of the very nature of human consciousness and memory. Besides the main movie, a DVD includes seven short features on specific creative therapies for Alzheimer&apos;s. Huebner and her colleagues also put together a resource book for the film,I Remember Better When I Paint: Treating Alzheimer&apos;s Through the Creative Arts, and they plan to publish another book on her mother&apos;s experience with the art students. Lazarus says that as good as art therapies may be, they will not work for every patient. Families need to educate professional caregivers about the personal histories of Alzheimer&apos;s patients, he says. Then caregivers can mine that information for guidance toward therapies that might be effective in drawing on patients&apos; remaining intellectual, aesthetic and emotional resources, however hidden they might seem when a patient moves to a nursing home. Lazarus says he encourages people in late middle age to make videos of themselves talking about their lives and histories, so caregivers can later be aware of and appeal to patients&apos; strengths and interests. Another therapy, presented in the film by geriatric psychiatrist Gene Cohen, is "Making Memories Together," a noncompetitive board game that people with memory disorders can play with their caregivers, thereby transferring knowledge about their personal histories. 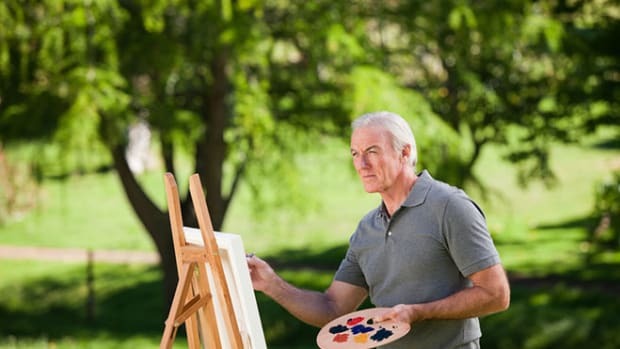 While society awaits more neurological research and better pharmaceutical approaches to Alzheimer&apos;s, the arts can help alleviate some of Alzheimer&apos;s most challenging symptoms, help maintain patients&apos; dignity and sense of worth and bring meaning to them, their families and friends. 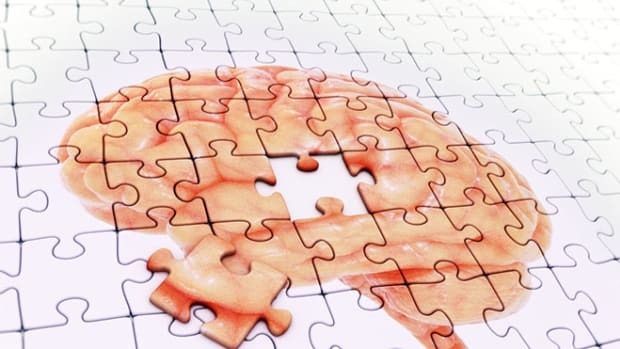 As Samuel Gandy, associate director of the Mount Sinai Medical Center Alzheimer&apos;s Research Center in New York, puts it: "Alzheimer&apos;s typically hits memory areas of the brain early, while sparing areas responsible for creativity. Art and music are perfect modalities for stimulating these creativity areas." 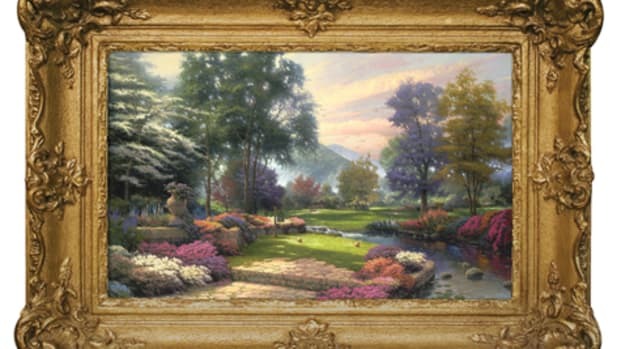 Thomas Kinkade, the best-selling “Painter of Light,” has never enjoyed the academic scrutiny accorded other homespun artists — until now.